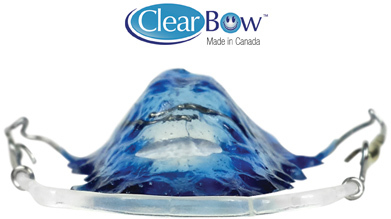 Introducing the virtually unbreakable ClearBow from PWG Orthodontic Specialties Ltd. A new aesthetic labial bow exceeding the durability, versatility and efficiency than any other type of steel or aesthetic labial wire. The ClearBow is adjustable with 3 prong pliers, BPA free, gentle on tooth enamel and anatomically designed for optimum tooth contact. It is the clear alternative for superior and more durable orthodontic appliances.